A Russian plane crash on Sunday, February 11th, resulted in the deaths of 65 passengers and 6 in-flight crew members, who varied in age from 5 to 79 years old. A preliminary report ruled out a terrorist attack and concluded that the passengers perished immediately in an explosion from the collision. The plane, an Antonov AN-148 operated by Saratov Airlines, took off at 2:21 PM from Moscow’s Domodedovo Airport en route to the southern city of Orsk. 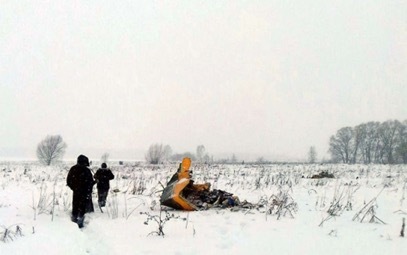 Minutes after its departure, the plane descended near Stepanovskoe, a village roughly 50 miles outside of Moscow. After takeoff the flight ascended to a height of 6,400 feet before rapidly declining at a rate of 3,300 feet per minute. During its descent the crew lost control of the plane’s communication signals. Investigation from the morning of February 13th indicates that the tragic crash might have been caused by an unfortunate human error, as pilots failed to turn on essential heating units, which are used to prevent icing on the plane’s measuring equipment while in-flight. Lacking proper heating, the two air speed indicators on the plane provided contradictory signals to the pilots, with one reading that the plane was flying at a speed of zero. Post-takeoff, the pilots put the plane into autopilot mode without realizing the error. Another aggravation to the heating unit issue was a prior decision made by the onboard captain, who decided not to de-ice the plane before embarking on its flight. The judgement to de-ice is dependent on the professional opinion of the flight crew, along with consideration of the current weather patterns and functioning capabilities of the aircraft. An incorrect determination can result in the freezing and malfunctioning of key equipments. A combination of the equipment failure and the conflicting signal data are presumed to be the catalyst to the eventual, devastating crash of the plane. However, the Antonov AN-148 aircraft model has a dubious performance record, which raised concerns among the aviation community. Initially, the Antonov company was managed by joint Russian-Ukrainian efforts. Conversely, following the recent Russian annexation of Crimea- a region which was in Ukraine-Russia has halted its end of the production process. This production delay has caused many carriers of the AN-148 to be in short supply of parts and vital equipments needed to repair these planes. Carriers of the model, such as Saratov Airlines, thus default on the upkeep of their aircrafts. Various engine shutdowns and flight test failures have been recorded for the AN-148; yet, the specific plane in question was reported to have been in adequate shape for flight on Sunday. Critics of poor plane maintenance are calling on the Russian government and its aviation agency, Rosaviatsia, to aid aircraft carriers in continuing to properly preserve their fleets in order to prevent such unfortunate disasters in the future. Search efforts at the crash site and analysis of the nature of the crash are still underway.